Chancellor Dr. Ray Wallace (l) joins faculty, administrators and the new teacher candidates at the pinning ceremony. (NEW ALBANY, Ind. 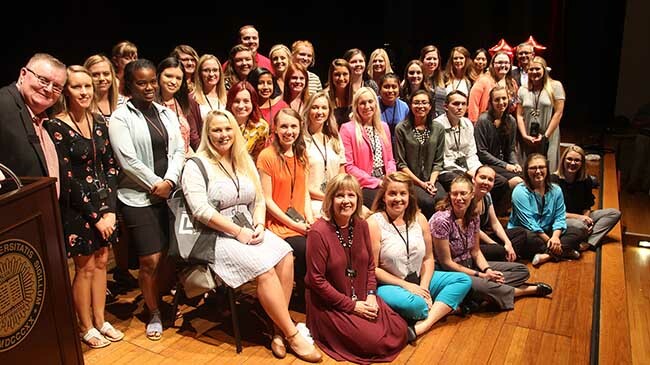 )–Each year, education majors entering their junior year, known as Block Three, gather for a pinning ceremony during which they receive recognition for their accomplishments thus far and encouragement for the long road ahead. This year’s ceremony, held in the Ogle Center during the first week of term, brought together 151 students as well as faculty from elementary, secondary and special education for a day of information and celebration. Dr. James Hollenbeck, professor of science education and coordinator of secondary education, set the tone in quoting the late Christa McAulife, the teacher who died in the Challenger shuttle mission. “I touch the future—I teach,” Hollenbeck said. Hollenbeck encouraged students to embrace the profession as a vocation, a calling and a way of life. “It’s worth it,” Hollenbeck said. Commitment to the totality of teaching impacts not only the classroom, but society, according to Hollenbeck. “We have a proud tradition of teaching high quality leaders who embrace diversity and lead in the transformation of their schools and communities,” Hollenbeck said. School of Education Dean Faye Camahalan provided a moving pendant to this inspiration by reading aloud the words of students about why they want to be teachers. Camahalan quantified the impact that such motivations can have: since 1941 IU Southeast has produced 4,400 Bachelors degree holders and 5,500 Masters degree holders in education. While the official duties of teachers are well delineated by statute, the real reach of a teacher’s influence goes much further. Camahalan urged her audience to get involved in campus organizations and to become confident in the knowledge that every society needs the skills they have committed to acquire and pass on. Homepage photo: IU Southeast elementary education major Kinley Kaelin poses for a photo with (from l) Chancellor Dr. Ray Wallace, Executive Vice Chancellor for Academic Affairs Dr. Uric Dufrene, and School of Education Dean Dr. Faye Camahalan.